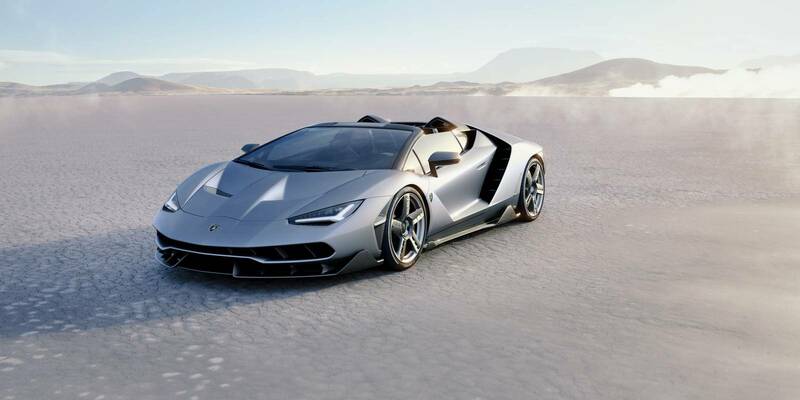 In order to honor the centenary of the Lamborghini founder, Mr Ferruccio Lamborghini, the Italian car constructor came with two models, one that was revealed in the Geneva Motor Show, it was the Lamborghini Centenario (the name says it, for centenary), seeing the success it had, Lamborghini came with a new one; The Lamborghini Centenario Roadster, an open top variant of the already exquisite coupe. Only 20 units were made, and all of them are already sold out, to 1,75 million euros each. 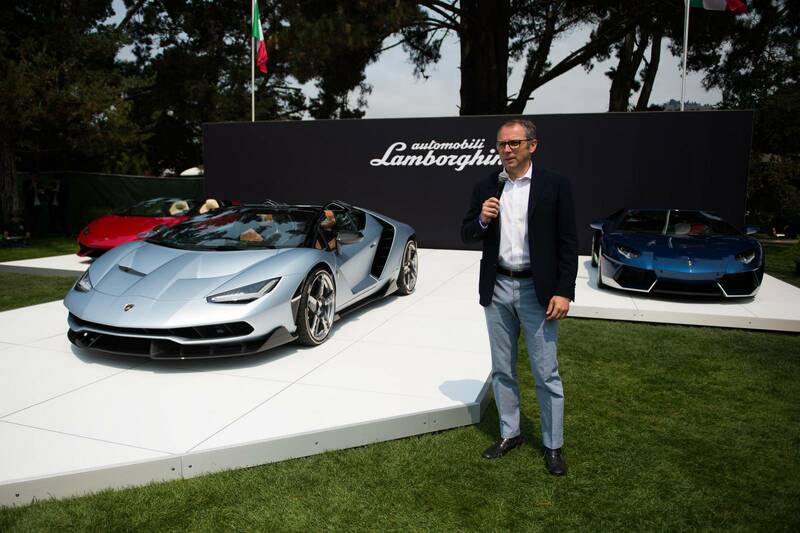 The Lamborghini Centenario Roadster was revealed at the Monterrey Car Week in California. It was designed by a team of engineers in the Centro Stile Lamborghini. Designers were given the freedom to go wild with their imagination with one goal : embody Lamborghini’s new design direction while keeping with the same philosophy of the founder. The car is made entirely from Carbon-fiber : monocoque frame and body work. The result is, a curvaceous profile and an enhanced aerodynamic design. The the low overhangs in the front and in the rear created the mono-body shape of the car. Optimal aerodynamic performance was achieved by an implementation of an air channel in the rear wall back of the headrests. It smooths the airflow from the cabin toward the rear of the car. This minimizes air recirculation and turbulence thus reducing inducted drag. Rear downforce is reduced with a large rear electronically operated spoiler that works in 3 positions. In the low rear, the car has been fitted with a large air diffuser, which optimizes airflow and distribution under the car. The rear wheel arches were enlarged to give place to the rear-wheel-steering system. Designers used new method for the painting that consists in dissolving the metal while diluting and diminishing its grains, to give a better silky soft touch to the car. The Centenario roadster comes in special matte exterior. The car sits on 20 inches specific forged wheels in the front, and 21 inches in the rear. The Centenario Roadster is to achieve great performance on the road. It has a 6.5L Multi Point Injection V12, the V makes a 60° angle. It produces 770 bhp @8500 rpm and a maximum torque of 650 Nm @5500 rpm. Power is channeled to the 4 wheels via an independent shifting rod 7-gears gearbox. The electronically controlled all-wheel-drive system comes from Haldex, and comes with a rear mechanical self-locking differential. All this mechanical advanced tech results in a +350 kph in top speed, 0 to 100 kph in 2,9 seconds, and thanks to carbon-ceramic brakes with fixed monobloc in aluminum with 6 pistons for the front and 4 pistons to the rear, and ventilated discs, the 100 to 0 is achieved in 31 m. The steering system is Lamborghini Dynamic Steering with variable steering ratio, and Lamborghini rear-wheel-steering that allows greater stability turning at high speeds and more precision at lower speeds. For the interior, clients car chose color according to their taste from the Lamborghini Ad Personam personalization program. Yet, the car features a luxurious interior with many specifications. The dashboard and rocket covers are covered in light brown alcantara with Bianco Polar leather inlets. Added to that, the driver can manually adjust his driving style, and car attitude. The 10 inches high definition screen allows the driver to browse the internet, check his position via a high satellite connectivity, music and other infotainment systems. The Lamborghini Aventador, most epic Lamborghini ever built. It has a refined style, but did not lose touch with the old Lamborghinis, it had that fearsome look, that monster way of dealing with things, no curves, but hard shaped lines instead. At the time, its main rival, was another monster, from the Italian Ferrari, The F12 Berlinetta, which has beaten the Aventador in all fields so far. That is why, Lamborghini presented to the world, not long ago The Aventador LP750-4 Superveloce. 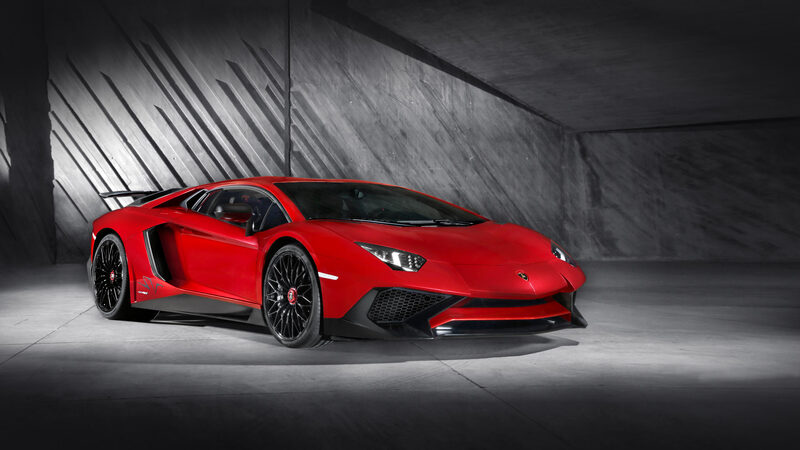 As the previous Lamborghini cars that carried the Superveloce : SV name, it is a responsibility towards it. There are quite some standards. The Murcielago SV was quite a hard car to handle, and it had character of its own. Furious on the road, fast on tracks, it was something. Before that, the Diablo SV, the heritage of SV, and the essence of power. Now it is the turn of the Aventador to show its muscles. Under the bonnet, it has the same engine as the stock Aventador, a 6.5L V12, developing now 740 bhp @8400 Rpms, that is 40 more than the stock version. Not only that, the SV now, races from to stop to 100 kph in just 2.8 seconds, instead of 3.0. Torque though remains the same, 690 Nm but the engine revs higher, @8500 Rpms. The SV has a 50 kg weight loss compared to the regular Aventador, now it only weighs 1525 kg. Top speed is said to be more than 217 mph (350 kph). The power is channeled to the four wheels through a 7-speed double-clutch transmission, the rear wheels do have an automatic lock differential, for letting the car play with its own tail. The performance above is achieved via a weight loss program and a new aerodynamic package. The the engine cover, the rear wing and wing panels, some of the interior, and the air intakes are now made in carbon fiber. The sound system is optional. The rear wing is the main contributor to aerodynamic efficiency and higher downforce, along with larger air intakes at the front and a larger rear diffuser, a side skirt, and two front wings. All that, without increasing drag, which gives it one of the lowest drag coefficient in the supercars world. 1st item : power to weight ratio, which for the Lamborghini Aventador SV is 485bhp per tonne. 2nd Item : aerodynamics. The new aerodynamic package not only gives the car a more aggressive look, but also, helps achieve higher performance. 3rd Item : the drivability of the car. For Lamborghini cars, it’s known that, too fast too furious, but with tech elements such as magneto-rheological pushrod suspension and Lamborghini Dynamic Steering, how would the SV react? All this technology, and high performance, isn’t for free, the SV has a really expensive price tag put on, at 400,000$ only 600 persons will be lucky enough to have it. Lamborghini says their car has no competitor, however, on a side note, The Ferrari is preparing a track focused version of its F12, which will make thing more interesting. That was one of the first pictures we could get from Lamborghini to have an “avant-goût” of what would its surprise to the Paris Auto Show look like. Top gear did get some of its pictures. It is a new step for Lamborghini, to enter in the hybrid race, after Ferrari, McLaren and Porsche. 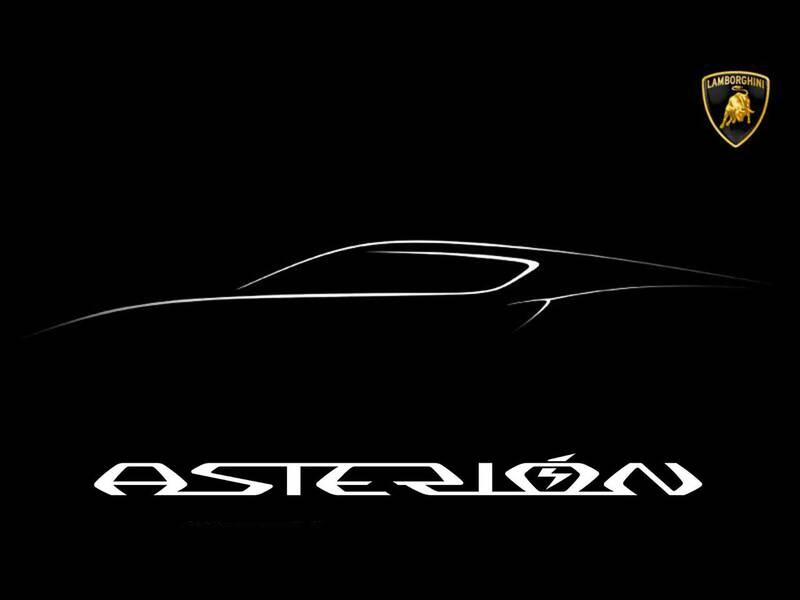 Maurizzio Reggianni, R&D Boss at Lamborghini says “Asterion proposes the future of Lamborghini”. It does not look like any Lamborghini produced before it, it looks softer, has a cleaner, less aggressive look that its predecessors. It is more technological, more in the future type of car. Even its name is different, The LPI, I is Ibrido, Hybrid in Italian. Though, it is not so different inside, in fact it uses the same monocoque carbon fiber chassis used on the Aventador mostly in its lower parts, and the same engine from the Huracan. The Asterion has the same engine as the Huracan, a longitudinal 5.2L V10 that delivers 610 bhp, that has a dual-clutch seven-speed rear transaxle automatic gearbox linked to it. In addition to the thermic engine, three electric engines are mounted on the car, one in the rear, and two in the front. Al together, they produce 220 KW, which is the equivalent of 300bhp. This makes a total of a 907 crazy horses, unleashed by a button. The car goes from 0 to 100km/h in just 3.0 seconds, and it is claimed to reach 199mph as a top speed. The rear electric motor, has a starter motor, and a generator. The other two, are used to insure four’wheel drive and torque vectoring since there is no mechanical connection between the front and rear axle. Batteries are placed in the central tunnel of the car. Adding all the electric stuff, batteries, generators, and motor, adds up to 280kg to the car, to make the total weight, 1800kg. But this does not effect the power, CO2 emissions of the car, or the fuel consumption. In fact, the CO2 emission are as low as 98g/km. Consumption from the thermal engine is 30mpg. Lamborghini claims that the combined consumption is estimated to 282mpg, which is to be verified. The car is said to be able to reach 125 km/h while powered only by the electric engines for 32 miles. 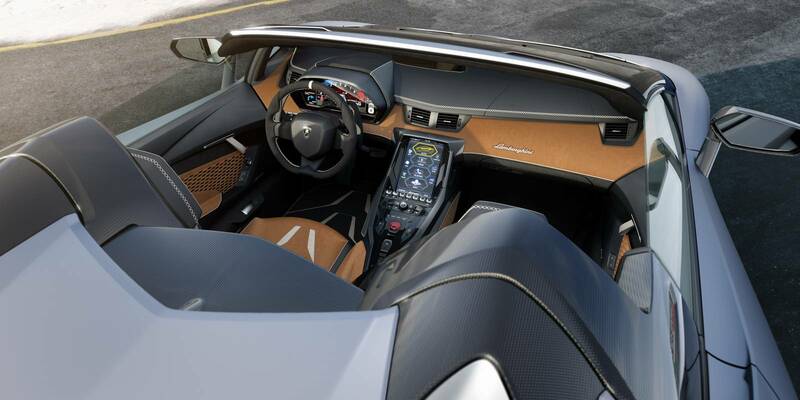 The interior is less sporty than the other Lamborghini models, it is luxurious, has ivory leather, aluminium, forged carbon, and yes even titanium. the dashboard, and other parts of the cabin are in white and brown leather. Seats are mounted higher than those on the Aventador or the Huracan. The steering wheel is inspired from the Miura’s one. 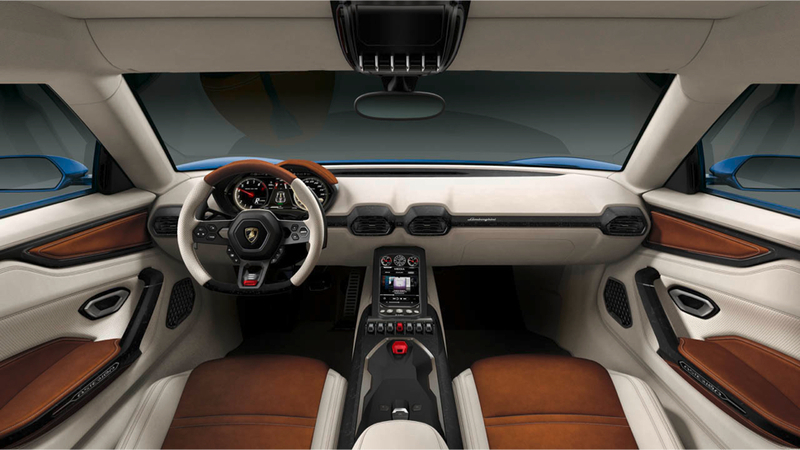 The driver can chose 3 driving modes, from buttons on the steering wheel, which are : Zero, for electric drive only, I which stands for Ibrido, it is for a maximum power choice, and T, for Termico, and then you’ll be driving a Huracan Lamborghini.